Two years ago today, I held my sweet boy for the first time. The feelings, they were so familiar...excitement, jubilation, fear, panic, overwhelming gratitude...and there were tears, many of them. I'd been here before, walked this road as I held each of our first three biological kids. 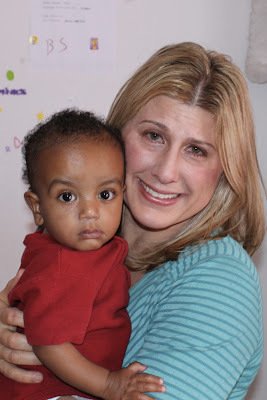 But two years ago today, I experienced all of those emotions and more - because with adoption - there is always more. In addition to the myriad of emotions that come with the addition of another child to your family, with adoption there is also the underlying layer of sorrow...of sadness...of loss. The loss of a birth mother, the time spent in an orphanage - lonely and afraid, the loss of a country. It is deep and it is heavy and it is a scary gap that my child had to walk alone in those early days. As parents it is easy to simply bask in the glow of adoption ideology...of cheery coming home videos...in the idea of "saving" a child. But at some point (usually quite quickly), reality comes crashing in and we realize that our child is hurting. We learn that their brain pathways have been physiologically altered because they have endured high levels of stress at an early age - when much of their "wiring" was still developing. They are from a hard place. What becomes even more evident is that as parents, it is our role to step out of the rosy little post-adoption fantasy, fall to our knees, roll up our sleeves and begin to walk with God as He heals these precious little souls. Caleb was nine months old when we finally held him for the first time. I assumed, like many adoptive parents, that our transition may have a bumpy start, but that we could push through it and be back to "normal" quickly. We did everything the books said to do. We cocooned, we attached, we were the only caregivers. What became evident in those early months, was that we were dealing with a very scared, sad and angry baby. It took a while for some of that to fully present itself, because he was so little...but in the midst of temper tantrums like I'd never known...I knew that we were dealing with deeper, more primal feelings. It was a bit of a battle for me, to finally accept that there was much more uphill to go, that "Gotcha Day" was merely the beginning of the journey. Oh, did I love this little boy...but most days, we didn't like each other much...but I hurt for him and I wanted to fight for him...to give him the love, the family, the healing...he deserved that. It took time and we had a lot of really hard days. Early on, the tantrums seemed endless. He had trouble speaking, so his frustration level was quite high. He took much of his anger out on me and it became quite obvious that he had little trust for women. But we just kept moving...one day at a time. I read, I researched, I drove to therapy and to counselors...and I prayed. Some may read this and wonder why I am sharing so much. We do try to keep much of Caleb's story private, until he is old enough to decide which portions he would like to reveal to others. But without sharing this honesty of the hard, it would not be possible to fully describe what God has done in this little boy...you can't see the light, until you have seen how truly dark it was. 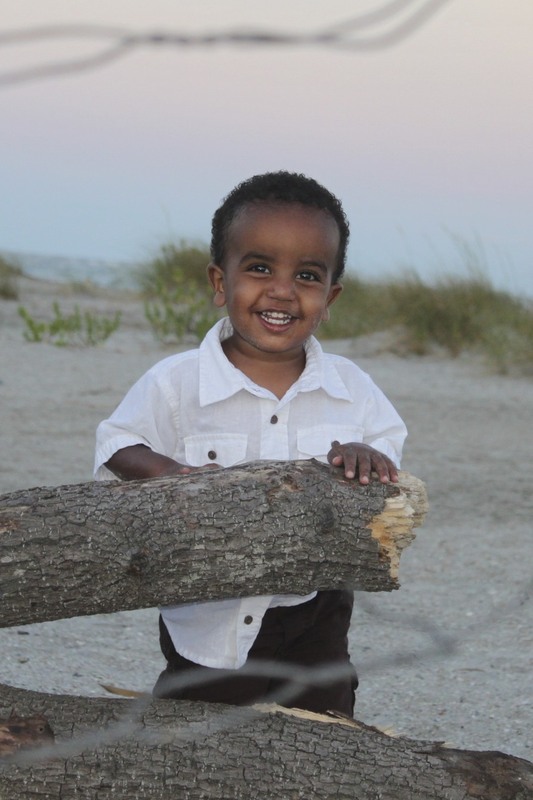 As I sit today, home two years from when I first held our precious Caleb Gebremedin Alemayehu, he is a changed child. There is a twinkle in his eye and he has a smile that can light a room. His laugh is completely infectious. He eats well, he sleeps well, he has grown like crazy, he is content, well-behaved and he is talking constantly. He is drop-dead handsome...and he finally loves and trusts his mama. Just last week, he wrapped his arms around me and said, "Loves you mama," for the very first time. It took all I had not to collapse, weeping, in my kitchen. There are no words to describe the delight I have in this child...and I suspect it is so much sweeter because we have walked the hard together. Each milestone feels like a battle won. 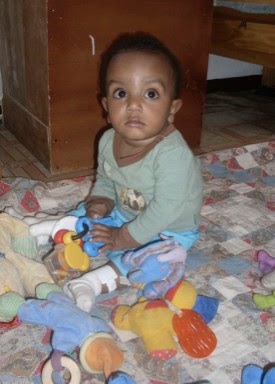 I saw where he was and I see how far he has come...and God has healed this little boy...and it has made our journey that much more special. Will there still be struggles? Absolutely. His history is complicated and there will be triggers and life changes that bring back the hard. But that is part of this process and my job, as mom, is to be there to walk through that with him. The transformation is nothing short of a miracle. People tell us quite frequently that we are so special and that Caleb is lucky because we have changed his life. I do not take offense, because I know the point they are trying to make...but this is bigger...so much bigger. Generations have been changed, for him certainly...but for us too. In us, the change has been profound and we will never be the same. Through this process, I have learned so much about myself...and my own sin. I have been stretched and I have struggled and grown more than I could have ever imagined. I learned about how selfish I really was. I learned what unconditional, true, active, committed every day love is. I learned about loving someone who didn't love me back. 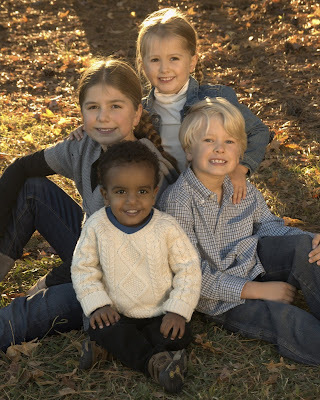 Throughout this process my other kids have learned about adoption. They have learned about Ethiopia, poverty, suffering, birth mothers, and lonely children. They have an African brother whom they adore. A brother who is brown when they are peach...and they can't even see it. As I look back, I am in awe of what God has done in two years. We look toward to the future and I know we will be dealing less with temper tantrums and more with issues of identity, race and where did I come from? I pray that I am ready. Right now, I am basking in God's faithfulness...and when the questions and issues become more complex, I know that He will give me the words I need. Adoption is a beautiful thing. My heart aches with joy for this precious child in whom I delight. There are so many deterrents to adoption. So many people talk about it...but never take that next step. Please think carefully if you are on the fence. Not everyone is called to adopt, certainly. We also cannot "save them all." But it terrifies me to think about what we would have lost, had we not stepped out in faith. God met us...but we could have so easily missed it. Because of our fear of the unknown, our excuses, our selfishness...we could have missed this. These kids aren't asking for perfect parents...they aren't asking for a white picket fence and tennis lessons at the country club...they just need a family. Families are always better. They deserve a family to fight for them and if you just love one...you really can change generations. Hey Tiffany~I am celebrating with you. I love your entire story. It's so true. We can celebrate so much more after a struggle. Thanks for sharing! What a beautiful story and example of God's grace and love towards each one of us! Thank you for sharing your heart! Tiffany - I'm writing this with blurred vision from the tears! Our Father is so faithful when he call us! He doesn't promise that it won't be hard but he does promise that He will walk us through it! You are such an example and I am thankful to call you friend and to have had you there for advice! So waiting to see where God is taking this family next! !